By Will Doran on Friday, February 3rd, 2017 at 1:52 p.m.
North Carolina Gov. 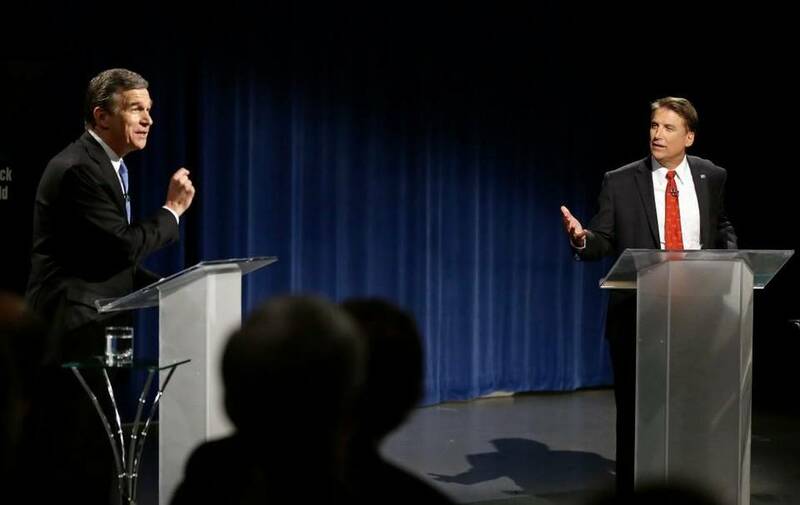 Pat McCrory, right, faced off with challenger Attorney General Roy Cooper, left, in a debate on Tuesday, Oct. 11. Associated Press photo. One of the biggest claims in several different 2016 North Carolina elections was over teacher pay – and whether or not Republican leaders had followed through on a promise to raise the average teacher's salary to $50,000. We didn't check it then because there was no way of knowing for sure. But now, finally, we do know. Education was one of the major areas of disagreement in the governor's race between Pat McCrory and Roy Cooper, including the question of whether GOP lawmakers had done enough to take care of teachers. McCrory, a Republican, defended the raises for teachers that had come under his watch. Cooper, a Democrat, said the state had not done enough. Democrats weren't always truthful with their claims. Cooper said teacher pay in North Carolina had fallen to 41st in the country under McCrory's watch. We rated that Mostly False. North Carolina did rank 41st at the time, but it had actually risen since McCrory entered office. Even Democratic presidential candidate Hillary Clinton waded into the fight. "Thanks to (North Carolina’s) governor and the legislature, the average teacher salary can barely support a family," Clinton told supporters in Raleigh last June. We rated that Mostly False, too. The average teacher makes more than the state's median household income, although it is right on the borderline for what's considered a "living wage" for a family of four. And she conveniently ignored the role that state Democratic leaders also played in the state's below-average teacher pay. Cooper had more luck with a claim about North Carolina's overall education spending, which he said dropped nearly $900 per student since the Great Recession. We rated that claim Mostly True. But what about teacher pay? The $50,000 claim was one that we were never able to check. It popped up in several races for the N.C. General Assembly, as well as in the governor's race. But there was no way of telling at the time whether it was right or wrong, since the data simply wasn't available. We knew there were raises, but given the state's slow financial reporting system and the fluid nature of staffing in schools – which have complicated pay schedules and unpredictable turnover from year to year – it was impossible to issue a Truth-O-Meter ruling on the claims before Election Day. But now we finally know the answer! Average teacher pay in North Carolina for the 2016-17 school year is on track to be $49,837, at least as of December. That's nearly $1,900 higher than last school year. And in reality, it's basically the same as $50,000. It's off by less than one half of one percent. But politically, it missed out on the key symbolism legislators were hoping for. Republicans can't say they raised wages to "more than $50,000" – let us know if they do, since now we can fact-check them – and most teachers won't see that nice round number on their W2 forms. We'll be keeping an eye on state budget discussions this spring. Cooper, now the governor, wants to bring the average North Carolina teacher's pay to at least the national average. In 2015-16 that was $58,064, according to the National Education Association. That was a campaign promise Cooper made – one of several dozen we'll be tracking with our Coop-O-Meter. Republican leaders have also said they want to give teachers more raises, although they haven't been quite as aggressive as Cooper. Senate leader Phil Berger, for instance, has said he wants to raise average teacher pay to $55,000 over the next two years. So North Carolina is obviously lagging behind the national average in teacher pay. But how else does it stack up? In the years between 2003-04 and 2013-14, average teacher pay in North Carolina dropped by a whopping 17.2 percent when adjusted for inflation. That was more than any other state, and it wasn't even particularly close. But shifting the time frame just one year, from 2004-05 to 2014-15, North Carolina's teacher pay dropped 10.2 percent – still not a good statistic, but the fourth-lowest drop instead of the No. 1 lowest. Why the improvement? For the 2014-15 school year, no other state raised its teacher pay by as much as the Tar Heel State. 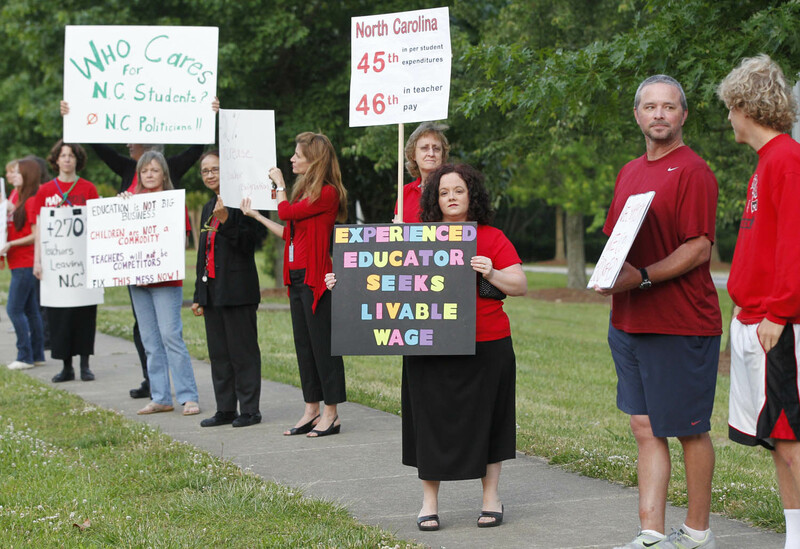 The average North Carolina teacher received a 6.3 percent raise that year, compared to a 1.4 percent average raise nationally. And finally, it's worth noting that anything you hear about teacher pay in North Carolina should come with the caveat that state leaders aren't totally responsible, for better or worse. Many of the state's 115 school districts – and all of the largest ones – give teachers additional pay supplements on top of their state state salaries. And figures like this year's $49,837 include both the state and local dollars spent on teacher pay. However, North Carolina also asks much less of local school districts than most other states. In the average state in 2015-16, local governments picked up 44 percent of the total K-12 funding. In North Carolina, however, local governments provided just 30 percent of the funding. National Education Association, "Rankings and Estimates, 2015 and 2016"
PolitiFact North Carolina, Sept. 2, 2016, "Roy Cooper falsely says North Carolina teacher pay ranking has fallen under Pat McCrory"
PolitiFact North Carolina, March 21, 2016, "Cooper says North Carolina's education spending per student hasn't bounced back since the recession"
PolitiFact North Carolina, June 28, 2016, "Hillary Clinton wrongly places full blame for NC teacher salaries on Republican leaders"